This charming 15th century house, located in the heart of the picturesque village of Cheyrac, is 1km from the fortress of Polignac and less than 10 minutes from Puy en Velay. 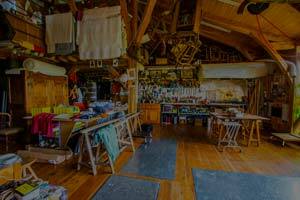 You will be welcomed in a lovely building, situated next to the upholsterer's workshop. This renovated old building, with it's beautiful architecture, was converted into the charming cottage and bed & breakfast hotel called Nattitude in 2013. 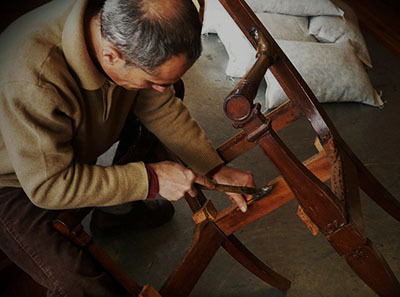 Have you ever dreamt about restoring an armchair? Do you feel attracted by doing a tapestry, makeover or transformation of your seats? A charming house from the XV century is located in the heart of the picturesque village of Cheyrac, 1km from the fortress of Polignac and less than 10 minutes from Puy en Velay. 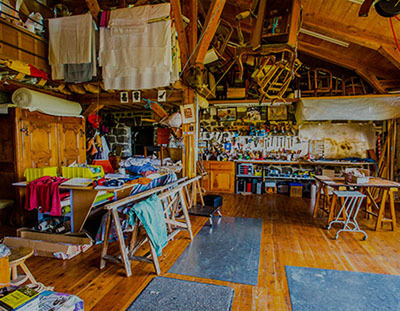 You will be received in the lovely place, adjacent to the upholsterer's workshop. This renovated old building from the XV century with beautiful arcitecture was converted into the charming cottage and bed & breakfast hotel called Nattitude* in 2013. 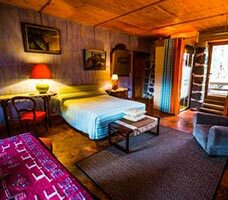 This place located in the centre of picturesque village of Cheyrac is tastefully furnished with the beautiful restored houses. It is adjoining the residence of the owner. It is adjoining the residence of the owner. The village can be seen from the balcony, the terrace and even the garden. You can come in to the large living room with the kitchen via the balcony and the terrace (on the same level) adjoining the enclosed garden (sheltered and furnished with garden furniture and a barbecue). There are 2 bedrooms, one mezzanine (2 double beds and 2 single beds. ), bathroom with a shower and separate toilet. We offer also a central heating, car park and baby equipment. Payment on arrival. 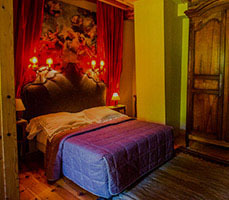 Upholsterer’s lodging is located in the charming house from XV century in the middle of the picturesque village of Cheyrac-Polignac, 1km from the fortress of Polignac and less than 10 minutes from Puy en Velay. You will be welcomed in this lovely place, adjacent to the upholsterer's workshop. This boulding was renovated to be a lovely bad & breakfast hotel and remind us the XV century. This is the reason why there is so many visable influences from the architecture of this time. This beautiful cottage is classified as 3 épis Gîte de France. It is waiting for you with the all comforts that you can find here. We have the house for 6 people: 2 rooms for 3 people (1 double bed and 1 single bad in each room and 2 bathrooms). 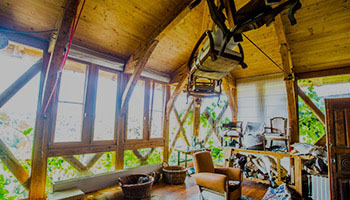 A large living room-kitchen with the entrance to balcony and terrace on the same level (adjoining the enclosed garden) sheltered and equipped with a garden furniture and a barbecue. There is also a central heating, car park, baby equipment. Payment on arrival. Electricity package. Charges are to be paid on site. 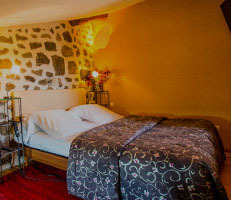 The cottage and bed & breakfast hotel of the upholsterer are located in an environment of great natural beauty and is near to the city of Puy-en-Velay. It is also near to some unusual castles, the closest one being Polignac, next to the river Loire.